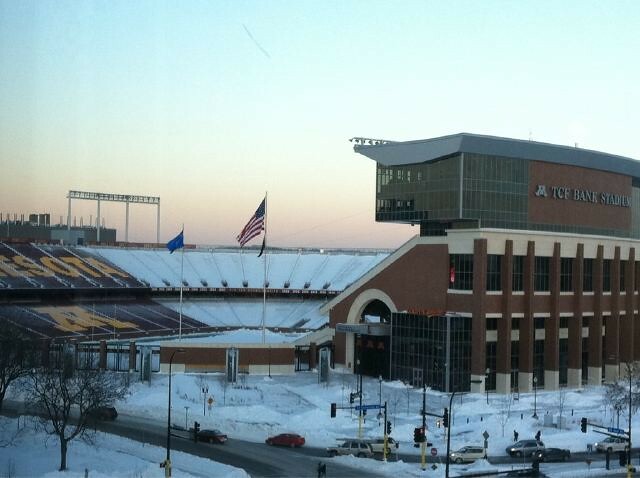 This is the view of a still snow-filled TCF Bank Stadium on the University of Minnesota campus in Minneapolis. Paid volunteers are busy working 4 hour shifts 16 hours a day to clear snow from the stands and ready the winterized NCAA stadium for a nationally televised Monday night NFL game featuring the currently displaced Minnesota Vikings versus the divisional rival Chicago Bears. This would be the first outdoor "home" game for the Vikings in nearly 30 years and is a result of Sunday morning's collapse of the Metrodome's Teflon roof under the weight of more than 17 inches of snow.